Tuscany loves beans, I love beans, and I love Tuscany. So imagine how much I like Tuscan beans. Fagioli all'uccelletto means literally "little bird beans" and supposedly it's to reflect the garlic and sage in the dish, which is also typically used on small game birds. 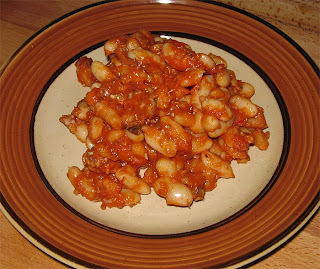 In a nutshell this is Italian pork and beans. Cannellini beans, garlic, sage, pork sausage (no fennel! ), tomatoes. The sausage is optional, I think it typically does not use sausage, but I wanted this as a main rather than a side. It's best to start with dry beans for their toothy texture, soak them overnight to prep. Once soaked (8 hr minimum), boil them till al dente. In a sautee pan, brown the sausage in olive oil. Once browned, add the garlic and sage. Only let the garlic get to golden, then add tomatoes and cook for 20 minutes. Add the beans. Cook for another 10-20 minutes, depending on doneness of beans desired. You may add water here to cook the beans further if necessary.